Here's summary of the progress of each one of our 11 regional Year End Polls for Emerging Artists. Due to high number of NYC submissions we organized that scene's results by genre. A big thank you to our sponsors for supporting our poll and providing prizes to the winners! Alt Rock/Revival Rock - Alt Folk - Electronic - Folk/Folk Rock - Hip Hop/World/Other - Indie Pop/Lo-Fi - Indie Rock - Metal - Psych Rock/Dream Pop - Songwriters - SonicBids submissions. Deli NYC issue 29 is out! Click on the cover ot read it!. ANYWAYYYY... the results of the Open Submissions are slowly coming toget and we are slowly going to publish them starting with NYC (check back!). Sonic Bids selections will be coming after that. Whether you were selected or not, it's always good to remember that in 1961 The Beatles were rejected by Decca with the following gems: "guitar groups are on the way out" and "The Beatles have no future in show business." Take that as a friendly reminder that there is no final authority on music, despite what pitchfork.com would have you believe. The next phase of the Poll - a vote open to the fans - is likely to start in the first week of January and end at the end of that same month. We'll spread the cities out a little bit to minimize contemporary traffic spikes that repeatedly brought our site down last year. So stay tuned. We should have the final results for our two separate final charts (fans poll and composite chart including the jurors' vote) by the end of January. Also, of course all this is possible also because of our sponsors - many of them are providing free studio time and prizes for the winners. Here they are - God Bless 'em! LIST OF PRIZES FOR POLL WINNERS COMING SOON! 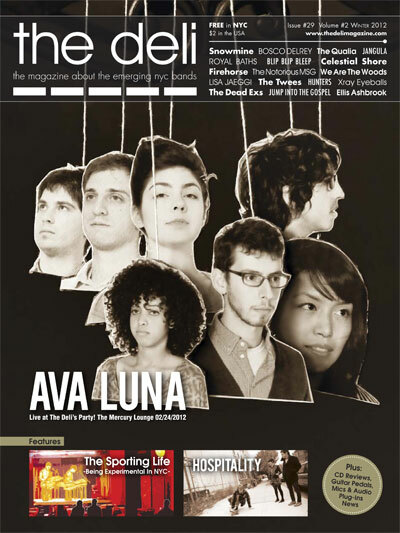 The Deli's NYC issue 28 is out! CMJ + Stomp Box Exhibit issue! The Deli's NYC fall 2011 issue is now out in the streets and shops of The Big Apple, peoples! 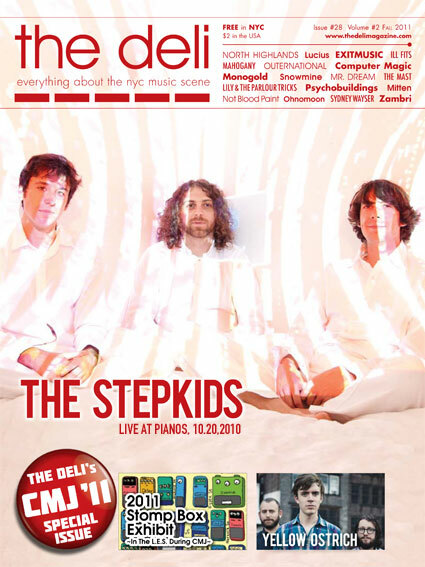 This issue's focus is on the Deli's official CMJ showcases at the upcoming Music Marathon and The Deli's phantasmagoric Stomp Box Exhibit - download it HERE or pick it up in any musical spot in The Lower East Side, Williamsburg, Bushwick, Chelsea, East+West Village, Park Slope, Greenpoint etc. etc. Deli - INDMUSIC Video Competition Winners! 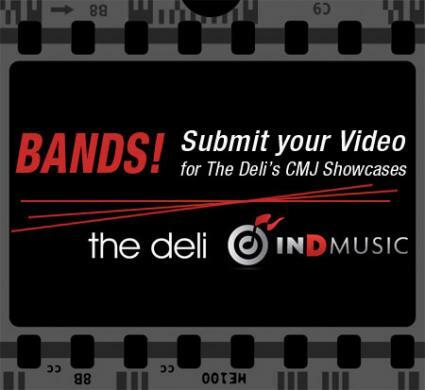 A few weeks ago The Deli teamed up with INDMUSIC to find the best unsigned and independent music videos to be featured between sets during some of The Deli's CMJ showcases at this year's Music Marathon. After hours and hours of "music-vision", The INDMUSIC staff finally delivered the list of winners - here's a playlist of all the selected videos. Starting today we'll slowly upload the ones we like in our local blogs. INDMUSIC is a Youtube Network designed to help bands monetize their video content without sacrificing creative control.